Me and the DunRun have a complicated relationship. Many years ago, a friend from my courier days rang me up and told me about a great ride he had heard about through another friend. He knew from our time working together that I loved riding at night to seaside swims at dawn. I had dragged him several times down bits of the A12 and the A127 to Southend in the mid 1980’s after midnight on a Friday, in the hope of a high tide, rather than a mess in the mud, which was what usually greeted us there. And, if the tide was out, rather a lot of mud. So when he heard about a ride on rather more friendly roads a decade or so later to a beach with rather less mud and a greater chance of a swim at dawn, he also thought of me. I guess this must have been around 1994 or 5 maybe. By this time, however, I had a small child and riding my bike was now done with her packed into a big orange plastic seat fixed on the back. There were two problems with his suggestion that I accompany him later that month. The first, the small child, was not insurmountable. I quite liked the idea of popping down to Dunwich with her on the back. The second obstacle, however, was a bit of a deal breaker. It was pay to enter and was, (a word that I hated in those days in relation to riding my bike, or to any activity, in truth) organised. The residual anarchist punk in me couldn’t possibly countenance paying to ride or being organised in any way, so I said no and didn’t go. A few years later, the same friend plus another one, came back to me and said, hey, what do you know, that ride is back on and this year it’s free! No organisation, just turn up and ride. Now they were talking! By now the toddler was grown up a bit and, sadly, way too big to go on the back of the bike but still too small to ride 115 or so miles overnight with me, so babysitters had to be found, and that was my first DunRun. I don’t even remember the exact year, only that it was a lovely night and we did indeed manage to slide down the shingle into the sea, very early that morning. With maybe only a hundred or so other riders. 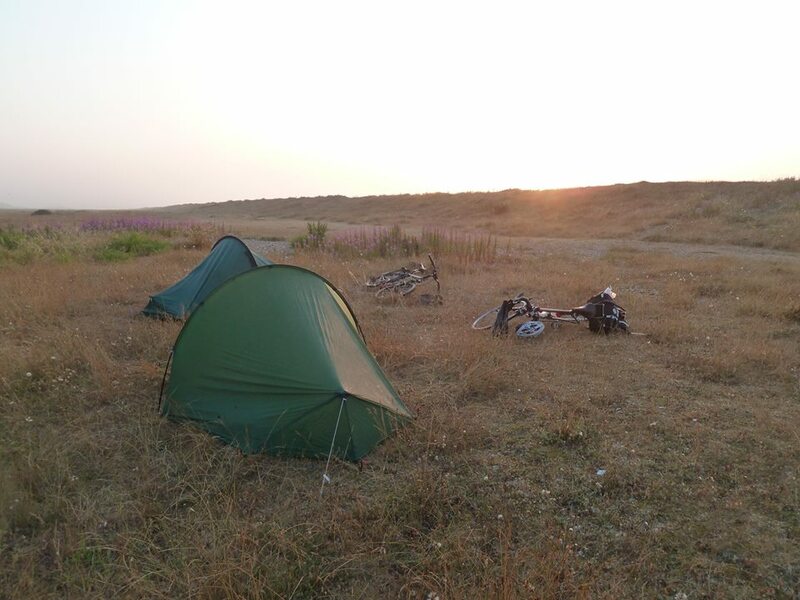 We took our tents and spent a couple of days riding up the coast to Norfolk afterwards. That became my favourite way to finish the ride off. Then I missed a year. Or possibly two. The next year, 2004, I think, I started alone as the demands of a being a single parent and a full time primary school teacher meant that I had lost touch with all my old riding buddies . This proved to be one of my best ever DunRuns despite that. Brilliant full moon. Bats flitting, huge, beautiful moths brushing past, owls hooting. 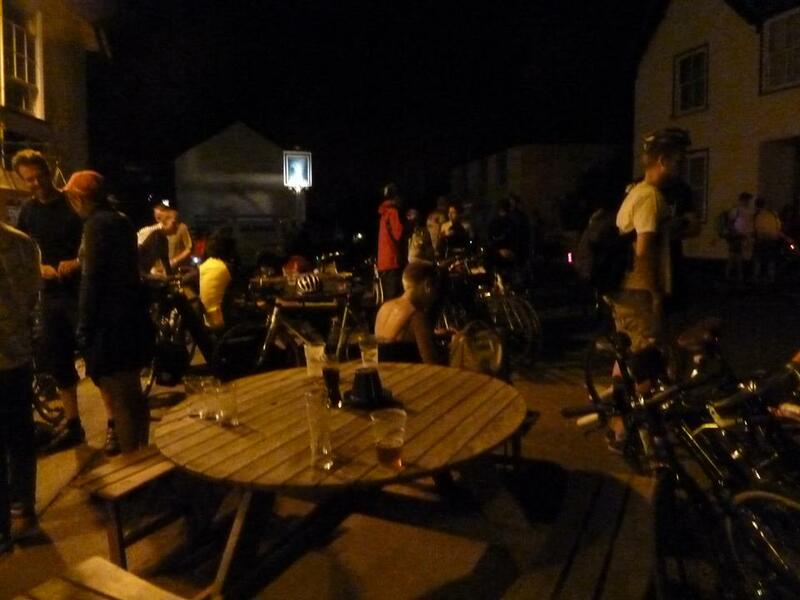 I met a whole bunch of lovely people on the way, stopped to help with various mechanicals, and then rode alongside a guy on fixed from just before Finchingfield till the end and he really appreciated my warning that the steep short up in Finchingfield was approaching. He was able to get a good burst of speed up, and shot past a quite a few younger and cooler guys on the way! So far so good. The DunRun and I were still at the beginning of a beautiful love affair. This ride was now well and truly on my calendar as a ride I loved and enjoyed. I even enjoyed the one I did when it was oh so wet! There is something quite romantic about swimming in the sea in the pouring rain. Again, I took my tent and stayed up for a few days. Then, I got sick. Badly sick. Cancer. The treatment meant that a 100 mile plus ride was definitely out that year. And I ended up missing two years. 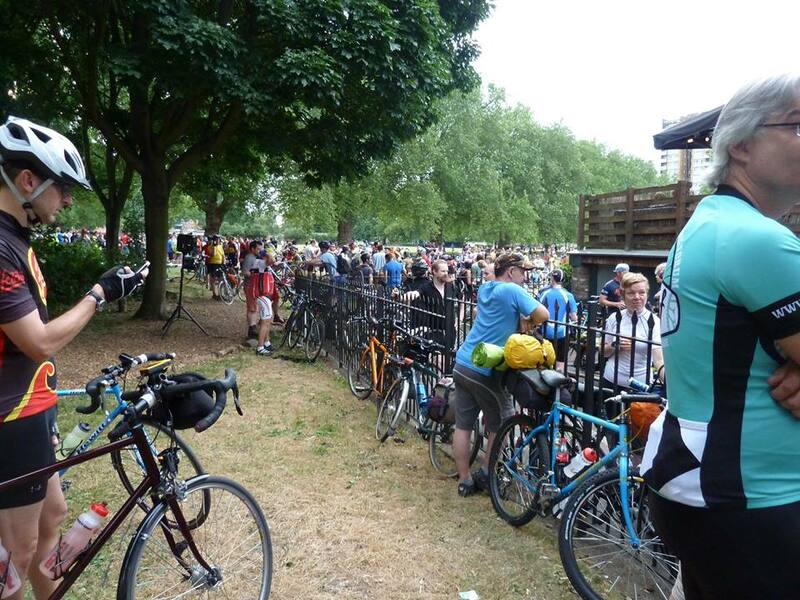 Then, when I came back, in 2008, as I rode into London Fields to meet up with a whole group of new cycling friends I had made in Lewisham, Southwark and Greenwich Cyclists, I was amazed at the crowds. In just a few years the DunRun had become huge! Sadly, for me, it was all too much. Looking back on that year, I guess I underestimated the effect that my illness and treatment had on my emotional health as well as my physical strength. There were quite a few fast racing clubs on the road that night, and the experience of hundreds of cyclists buzzing past me on the roads to Epping, without a hello or even brief nod of the head, was almost overwhelming. Then at one point, a large group of riders in tight formation overtook me at the same time as an oncoming car decided to overtake another. The group were forced to pull in sharply to the left, not realising in their driven, heads down, team focussed mindset that another, quite small person on a bike was there. I was forced to fling myself off the road into the forest, breaking a spoke, and bruising and grazing myself. The road train just carried on, oblivious. To this day, I guess they have no idea that I was ever there. Suddenly I was thrown back into the bad days of my cancer treatment, when you realise just how insignificant and fragile you are as a human being, how easily you can be reduced to nothing. My friends had not realised in the dark what had happened. I just turned round and rode home. But I really didn’t want that to be my last DunRun. So the following year I did it again. With lovely friends, had a great time, cool clear night, all the magic of the ride back. I rode to Diss like a maniac with one friend the next morning and we just scraped our way, sweating like little piglets, and grinning like fools, on to the train with seconds to spare. So it seemed all was well with me and the DunRun again. The following year, work made it impossible, but the year after I was really looking forward to it. Again, those fast chaingangs and the Epping Rd, but I wasn’t so fragile anymore- 3 years post cancer my confidence was back. Then, I must have bumped into one of the most unpleasant people on the ride that year, who swore aggressively at me as he passed, then immediately slowed, so I overtook him- he then sat on my wheel for ages, finally choosing a moment when a fast group was overtaking him to try and overtake me again, swerving dangerously close to avoid those riders passing him. We ended up having a huge slanging match and I arrived at the Wakes Arms garage to regroup with my friends feeling rubbish again. As one friend tried to raise my spirits and remind me that past Epping the ride spreads out and you can forget the fools, and just enjoy the ride and being with your mates, another group of cyclists began swearing foully at a motorist who had quite politely asked them to move their bikes so he could exit the garage. Something inside me whispered, do you really want to ride with people like this? And once again I just turned round and rode home, forgetting that I actually had a great bunch of mates to ride with, and in a few miles time could have forgotten the nasty folk completely. So, 2013 DunRun arrived. I decided to leave later and avoid the crowds. It was a good decision. So glad I did this DunRun, so glad I decided to stay up there and do the coastal 4 ferry ride back, and so grateful to the wonderful members of Team Slow, the guys who rode with me through the Epping badlands. They were such great company to Moreton, and this, along with the fact that the fast chaingangs were long gone by the time we rolled along these roads, meant I experienced the DunRun I have known and loved since the days rider numbers were only in the very low hundreds. Wonderful. Time to greet and acknowledge other riders with a smile when passing or being passed. Time to stop and ask riders if they were OK when stopped at the roadside. Time to stop and help if needed. Time to spot the amazing moths that flit through the air, time to hear the owls call, spot the shadows of bats gliding past. As the ride progressed, the cool, damp cloud that settled upon us made waiting at regrouping points a bit problematic for me. A ten-minute stop I can handle, but more than that and I chill and shiver in those conditions (quite cool and drizzly damp) even with the extra layers I had brought. After Finchingfield, Wunja, who had come over from the Netherlands to do the ride, and I, dropped the rest of Team Slow, and carried on together at a similar pace for a while, a pace just right to keep my body temperature up. But Wunja was pretty tired, having done so much travelling already, and eventually his need for sleep overtook him. We stopped at a crossroads where he attempted to nap while I chatted to another resting group of riders. Then we took off again. But he hadn’t managed to sleep enough at that last stop and as I pulled into Needham Lake in the vain hope the toilets might be open, I realised I had lost him. As I was about to leave, the group I had chatted to before, turned up. “Your mate is kipping in a bus shelter,” they informed me, a hint of incredulity in their voices. I reckoned that was just what he needed, so headed off alone, knowing he’d be fine once he woke, but I would get chilled to the core if I rode back and waited. I passed a few people at the roadside, lent tyre irons and practical help here and there. My trusty Var lever was much appreciated by one guy struggling to refit an extremely skinny tyre. Then, maybe 15 miles to go I met up with two of the people I had led up to Hackney Fields. We chatted a bit. It seems they had belted out of Hackney for the first twenty miles or so and were paying the price now, I think! 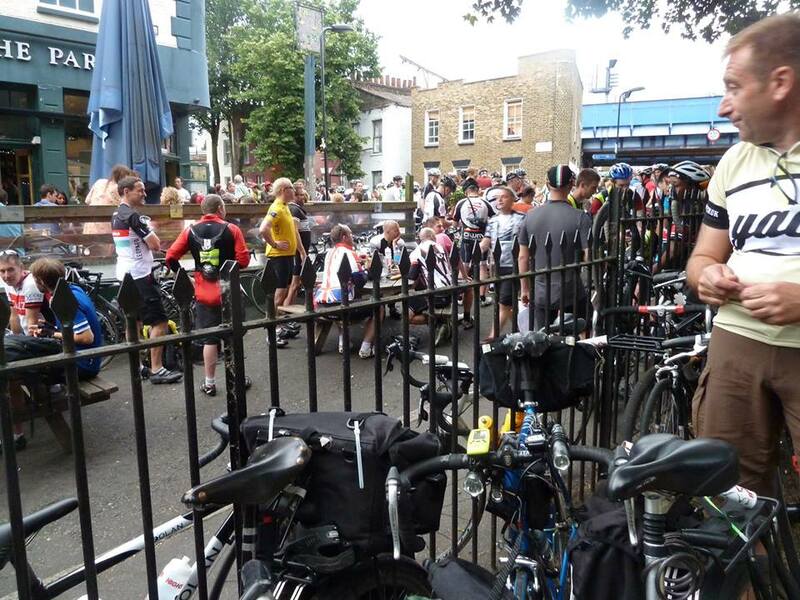 Then onwards again and just maybe 9 miles to the finish, met 3 more from my Lewisham Cyclists feeder ride. In my enthusiasm I took them a few yards in the wrong direction, which would have been OK except it was down a bit of a hill and two of them really had no legs left. I promised them they could beat me with big sticks at Dunwich and that seemed to do the trick. They followed me and the third guy (remarkably fresh still and on fixed) back up the little hill on to the right route again. The final glide to the beach was so much fun. Amazingly, I felt fresher than I had at the start. And starting later had the added advantage of a much smaller queue for breakfast. Over breakfast and the following hours waiting for the rest of my group, I met person after person I knew from other rides, other DD’s etc. including Auntie Helen and the lovely Poppy. (Terrific flapjacks, AH). I went down to the coaches to fulfill my promise to Bermondsey Bill to help out loading them up. However, he had done such a good job of organising it all, my help was not needed so I went back to the warmth and comfort of my sleeping bag. The hours just flew by, watching the madness and mayhem subside, as rider after rider left in car, coach or awheel. Gradually, it became quieter and quieter and when Team Slow finally arrived there were maybe just a hundred or so scattered around the cafe and the beach. A couple more people who recognised me from ages back came up for a brief reminisce. Finally, we rolled out our roll mats and dozed on the beach. As evening approached, just a few stragglers remained. 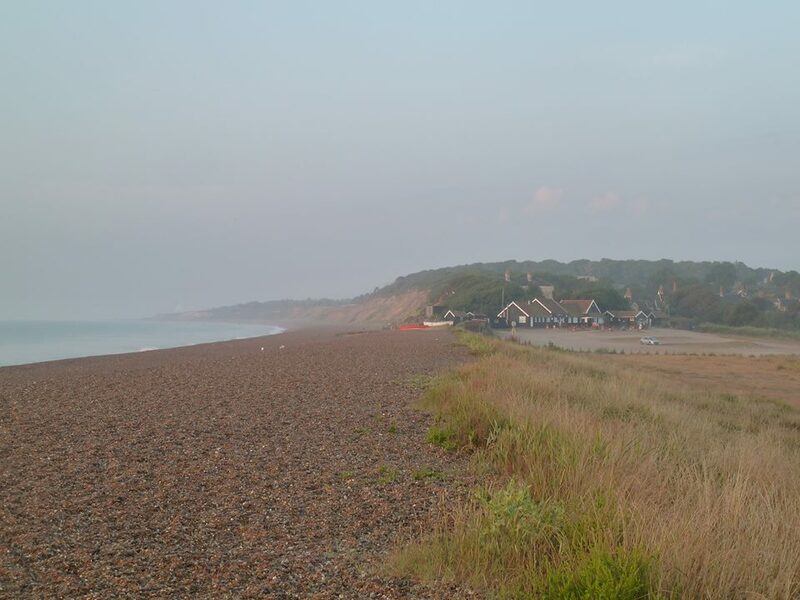 Dunwich, the quiet, isolated little beach, constantly returning bit by bit to the sea, was back. The amazing Team Slow and I camped just behind the beach that night and awoke to find a sunrise that DunRunners dream of. A day too late for most, sadly. 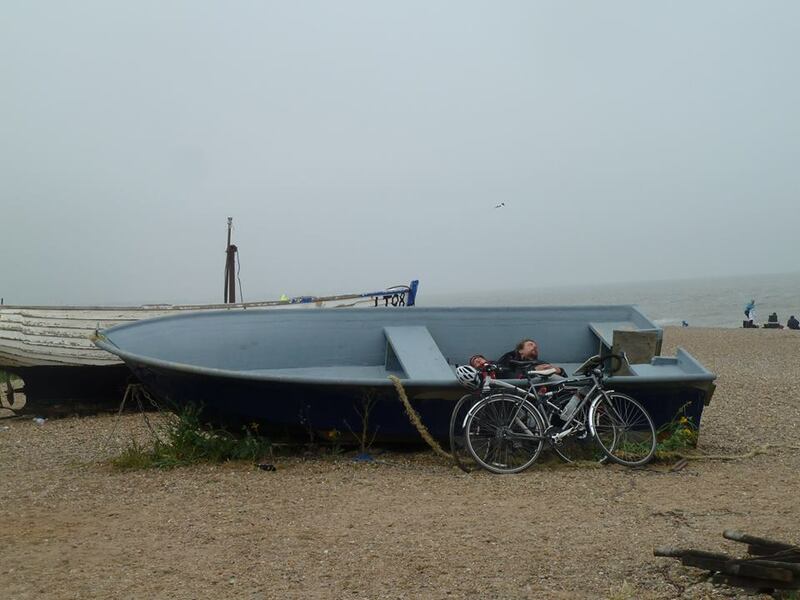 But we made tea, broke camp in the warm sunshine, and then headed off, some homewards, myself and one Team Slow member, my friend Peter, to ride back over two days via four river estuary ferries scattered along the Suffolk and Essex coastline. All in all, the perfect DunRun. I thought it was you, Will. Lovely to see you in Hackney Fields, too. Hope your ride was as good as mine.